Are you feeling it too? That need to rectify your Holiday indulgences by swapping out the cookies and hot chocolates for big unique salads loaded with all the good things winter has to offer? I sure am. 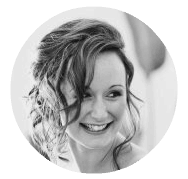 I justify the December over indulgence with the ‘och but it’s the Holidays‘ excuse, and we do keep it cleaner by only indulging in homemade cookies, but who am I kidding…..sugar is sugar 🙂 I have no regrets…. 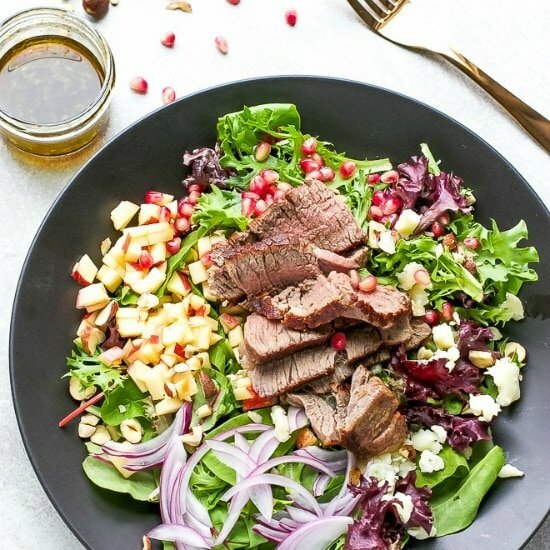 But now is the time to change it up, and I have turned to my fellow bloggers to provide a delicious array of unique salads for winter to get me going. 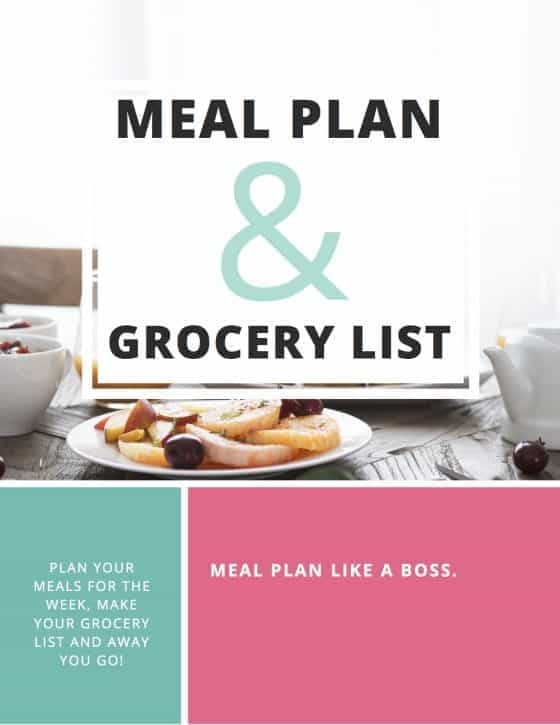 I find it easier to incorporate salads into my weekly meal planning if we switch it up and have something different every time. Now for those amazingly unique salads! 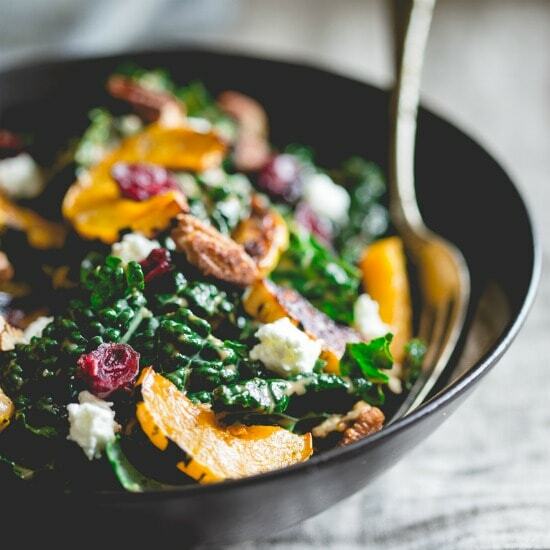 This Kale Salad with Roasted Delicata Squash, Chèvre, Dried Cranberries and Spiced Pecans from Healthy Seasonal Recipes. The title is a bit of a mouthful, but the photos definitely make me want a mouthful 🙂 All those ingredients together in one bowl just spells delicious. Is there anything better than a big tray of roasted veggies? I think not! 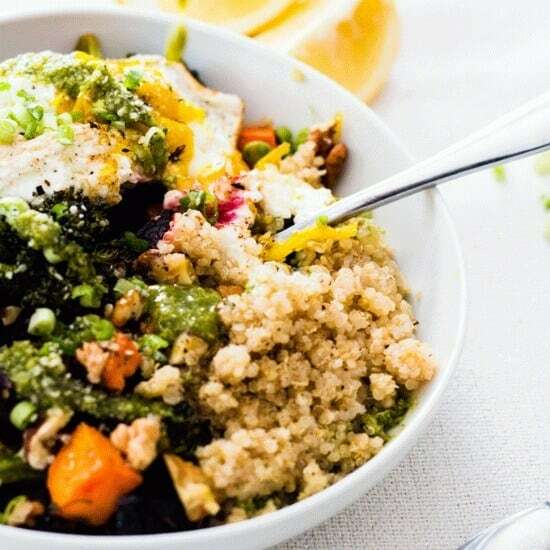 Pair them with quinoa in this Roasted Winter Vegetable Bowl with a quick and easy basil pesto hummus dressing, and you are raring to go with a delicious and nutritious bowl that really takes no effort at all to put together. From Whole Food Bellies (that’s me). You had me at pomegranate. 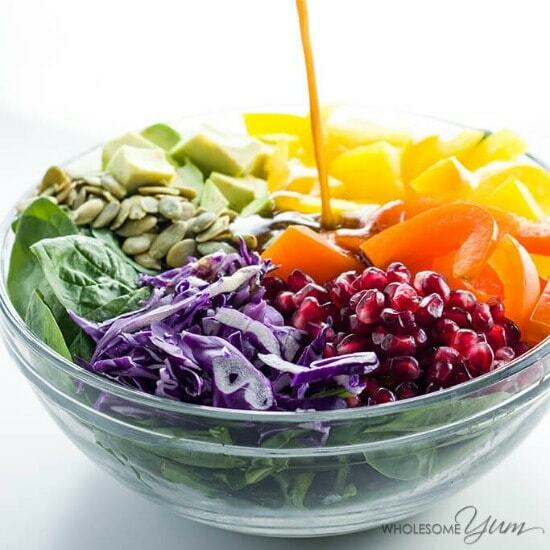 This Rainbow Salad Recipe with Pomegranate Vinaigrette from Wholesome Yum adds a fresh splash of color to winter. 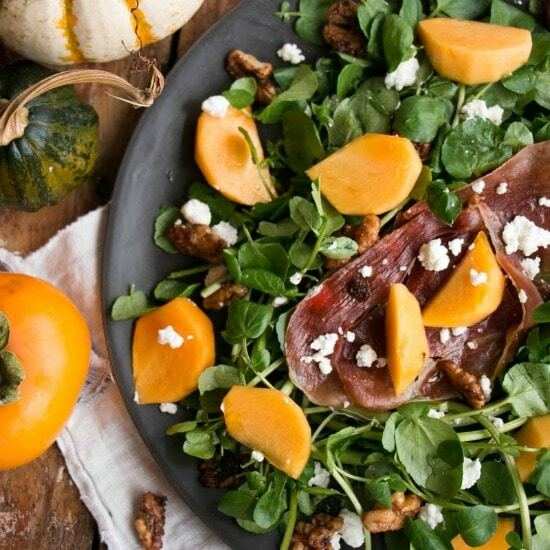 Doesn’t this Persimmons and Watercress Salad with Candied Walnuts and Goat’s Cheese look just divine? I love persimmons, and always look froward to devouring them at this time of year. From My Kitchen Love. 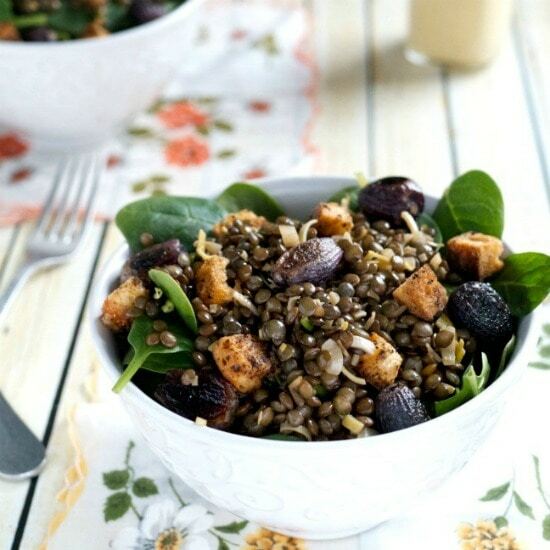 I just love how filling and full of flavor this Rockin’ Mid-Winter Lentil Spinach Salad with Prune Vinaigrette from Midlife Croissant is. 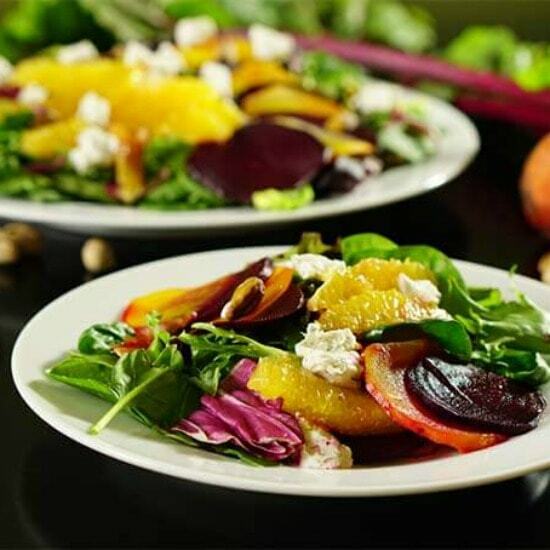 Full of delicious flavors and crunch, this Roasted Beet Orange and Pistachio Salad from Bowl Me Over is just gorgeous and contains lots of health benefits too. 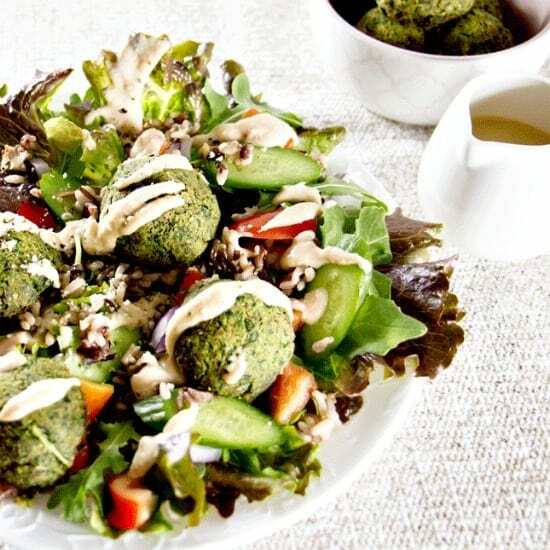 Baked Almond Crunch Falafel Bowl with Two Second Dressing is the perfect comfort food salad. The falafels are still nice and hot from the oven, and when paired with some rice and lots of fresh, raw veg, they take on a lighter note, which is a much appreciated break from the heavier winter fare. From Whole Food Bellies (that’s me). 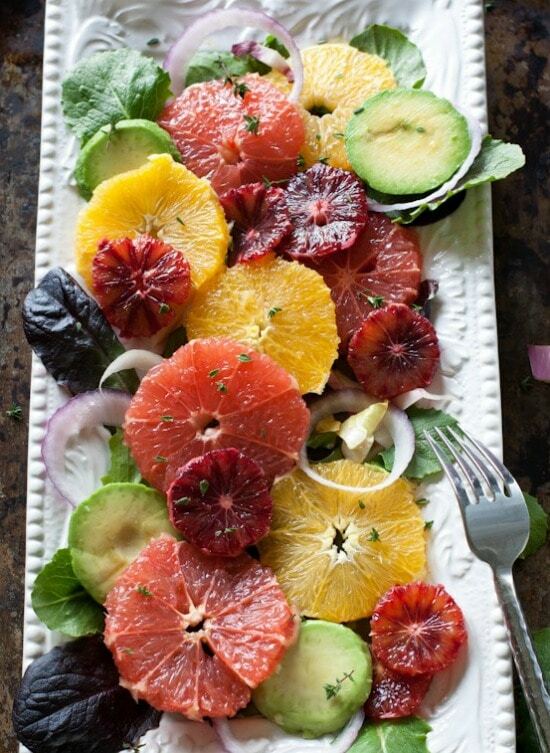 I just love all the colors going on in this Orange Dijon Vinaigrette on a Winter Citrus Salad. It would look so so gorgeous as a centerpiece for a special lunch. From What a Girl Eats. 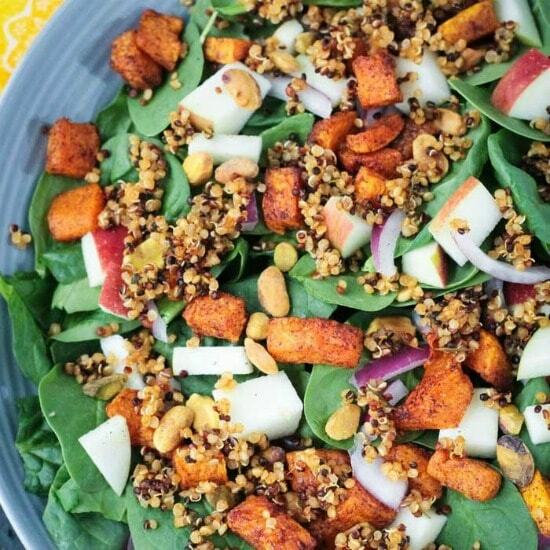 I need this Quinoa Spinach Salad with Butternut Squash and Apple in my life ASAP. So many awesome flavors in one bowl! From Veggie Inspired Journey. You want more?? I thought so! Fillet Mignon combined with mixed greens, pomegranate seeds, blue cheese, onions, chopped hazelnuts and chopped apple…umm yes please. This is ticking all the essential boxes in our house. Fillet Mignon Fall Salad from Cooking LSL. 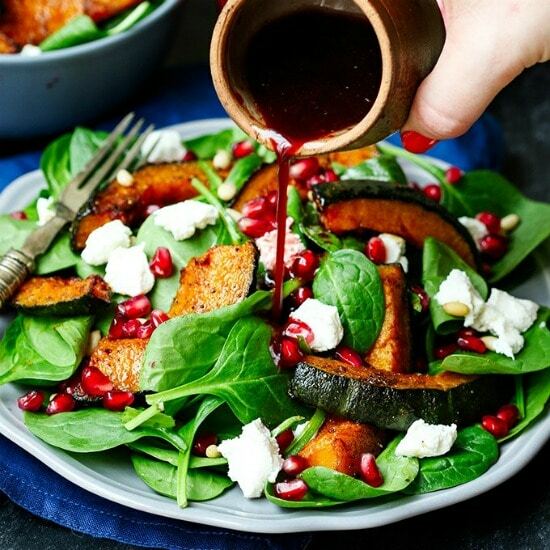 I was so excited to try the pomegranate dressing in this Roasted Kabocha and Goat’s Cheese Salad with Pomegranate Dressing from Kitchen Sanctuary, and it did not disappoint! Just amazing. 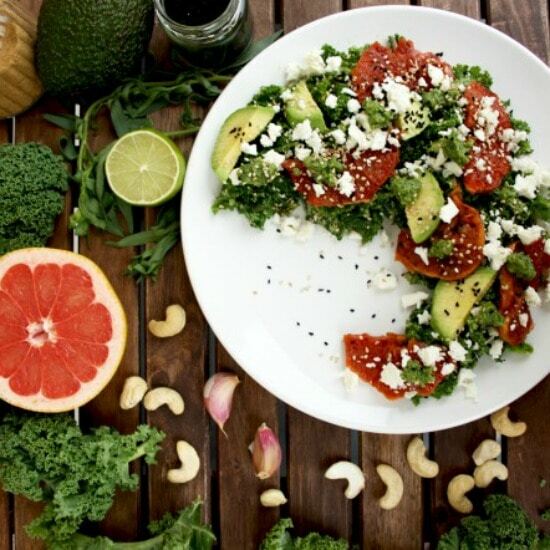 This revitalizing and light Kale Salad with Caramelized Grapefruit, Avocado, Feta and Pesto Dressing is a must try detox salad to kick things off right in the New Year. I just love caramelized citrus. Courtesy of Happy Kitchen Rocks. 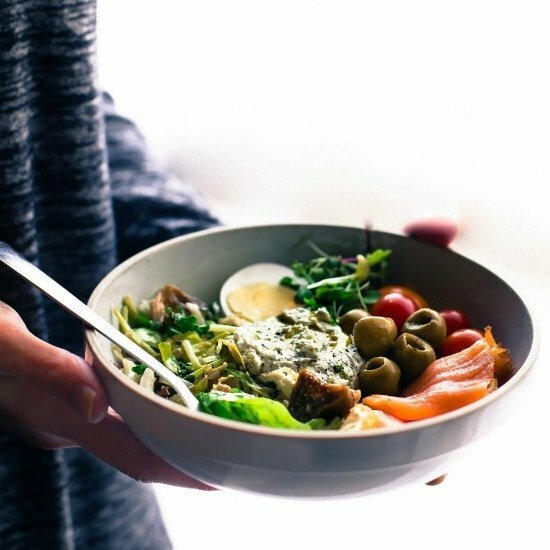 This Warm Greens Salad with Smoked Salmon and Goat cheese is sure to satisfy your tastebuds and nourish your Body! I just love the flavors in this unique salad recipe courtesy of Cotter Crunch. 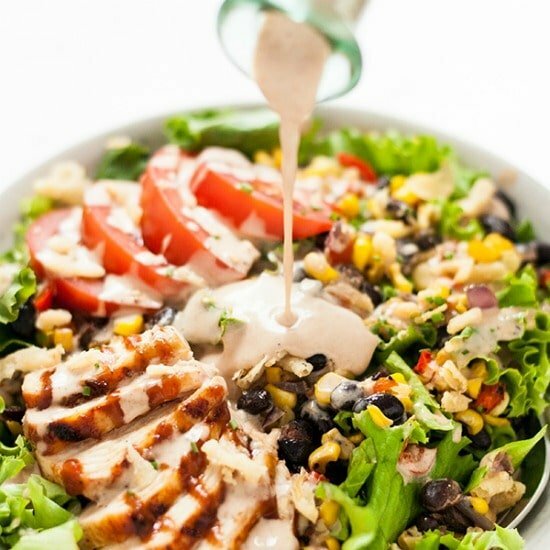 This Copycat Panera Bread BBQ Chicken Salad is as healthy as it is tasty, and so quick and easy that it practically begs you to make it for a simple weeknight dinner! From The Life Jolie. A true winter bliss salad! 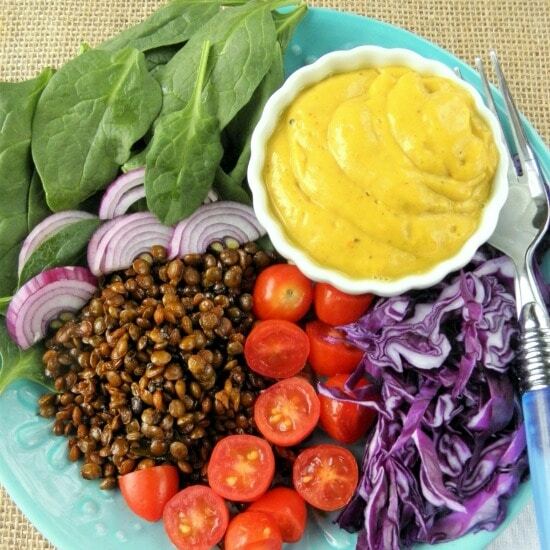 Warm curried lentils combined with veggies and a super healthy mango ginger and avocado dressing! From Indfused. 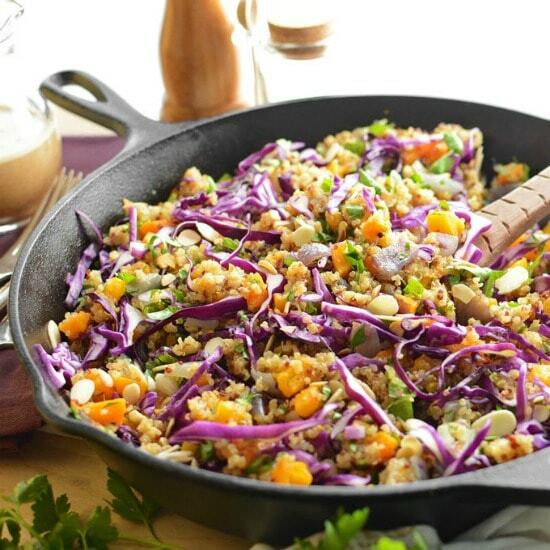 I just had to include this Warm Butternut, Red Cabbage, Quinoa, and Almond Salad as I am a firm believer than cabbage is underutilized, and it needs some love. It’s filling and savory enough for dinner, and it’s packed with colorful veggies to help your glow return after a fun-filled weekend. From Simple Seasonal. And there we have it. 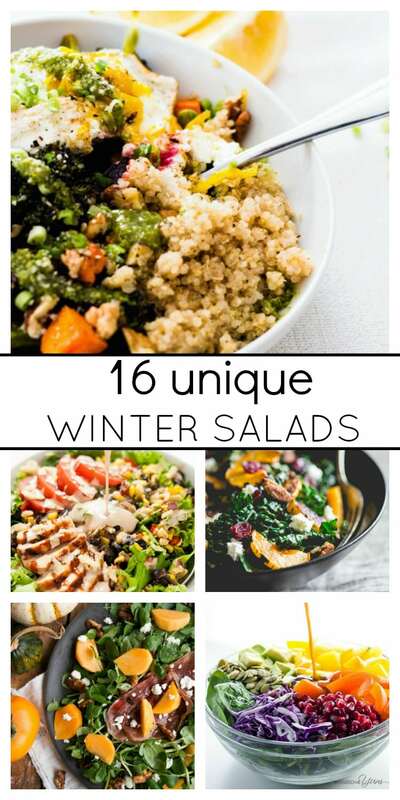 16 unique salads for winter to keep you going for the rest of the month. Which one will you be trying first? Happy eating. All the dishes look so amazing. I love mostly your BBQ chicken salad. Thank you for sharing! I like to eat colorful food. Almost all salads presented in this post are combine the rainbow colors what makes them even more attractive. I love this roundup! I’ve been looking for new ideas for winter salads. Thanks for including my rainbow salad recipe, too. Thanks Maya! Love the rainbow salad, so pretty! What a great roundup! Love the recipes and all the vibrant colours. Thank you! What a lovely winter salad round up! I struggle with salads this time of year! It can be challenging to find salads that feel satisfying and comforting now. Me too!! I always go straight for the comfort foods when the weather is cold, but too many just give you that heavy feeling! This is such a great salad roundup! I’m loving that winter grapefruit citrus one! Thanks Rachelle 🙂 I know, how pretty is it!! Thank you so much for including my recipe in this delicious round-up! There are amazing salads here – something for everyone! Did some sharing to help pass the word. Happy New Year to you! So many recipes to keep the salad train going straight through till Spring! Thanks for including my persimmons salad! Exactly 🙂 No worries, LOVE persimmons!! Thank you! I have such an endless love for salads this post will come in very handy this winter!